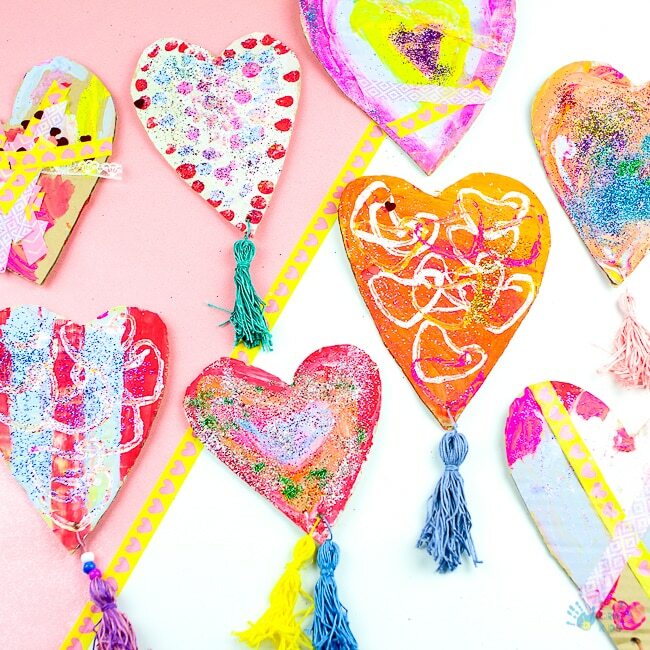 These gorgeous Recycled Cardboard Heart decorations are easy to make and are entirely process-led. 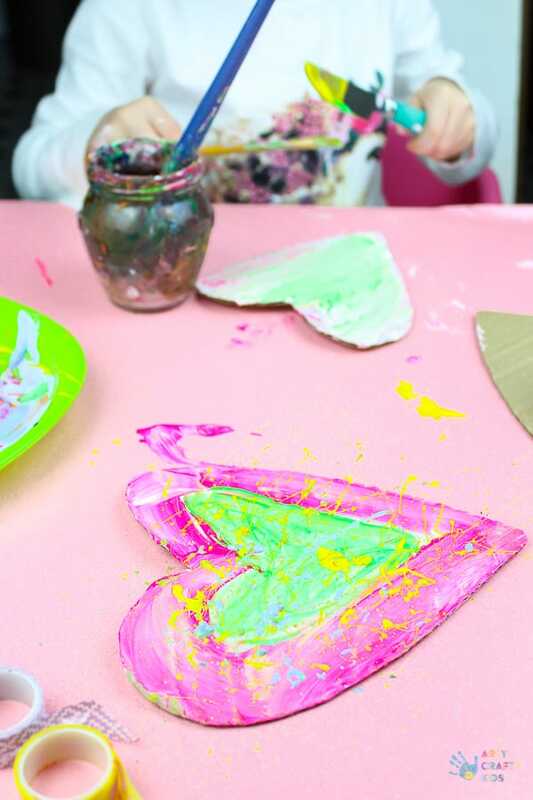 Arty Crafty Kids will have the best time exploring various painting techniques to create their hearts, adding depth and texture as they layer their base with prints and embellishments. It’s entirely open-ended and they can reuse materials found in the recycling bin or bottom of the craft supply box. Consider using bottle tops, paper rolls, bubble wrap and sponges for printing. As well as sequins and glitter for a little bling. 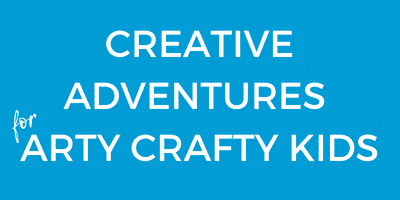 This craft is about enabling your Arty Crafty Kids to freely explore their creativity by experimenting with the materials they have to hand. The Loren variety the better and there really isn’t a right or wrong; it’s all about having fun. 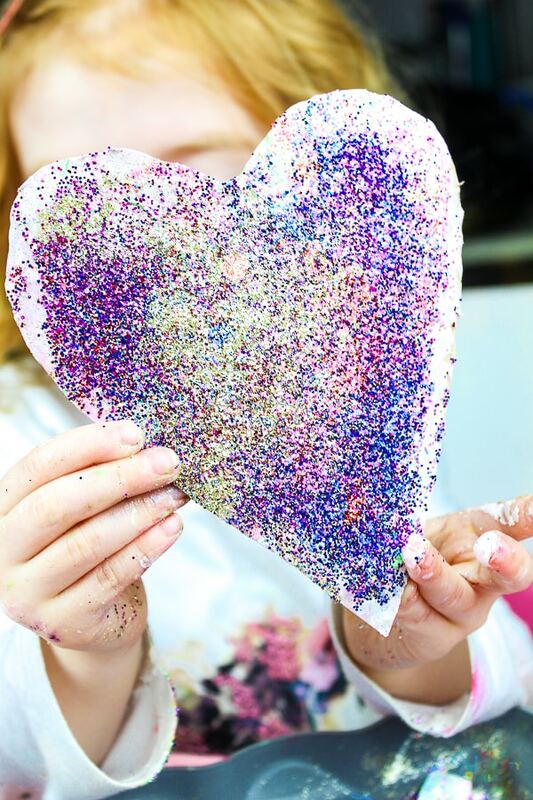 And while your children are busily creating their hearts, why not indulge in some crafting for yourself? 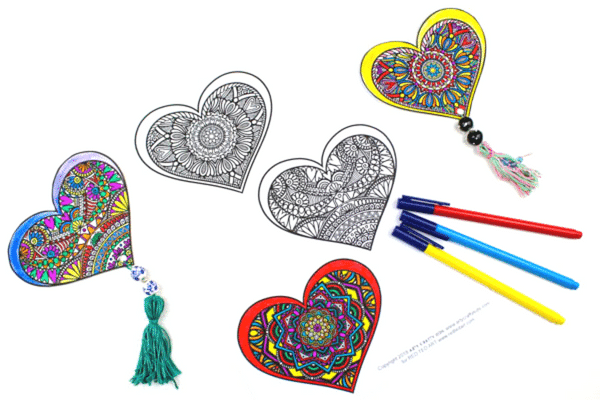 These hearts are a child version of a collection of heart bookmarks we recently created for the fabulous Red Ted Art, where all three designs can be downloaded for FREE! 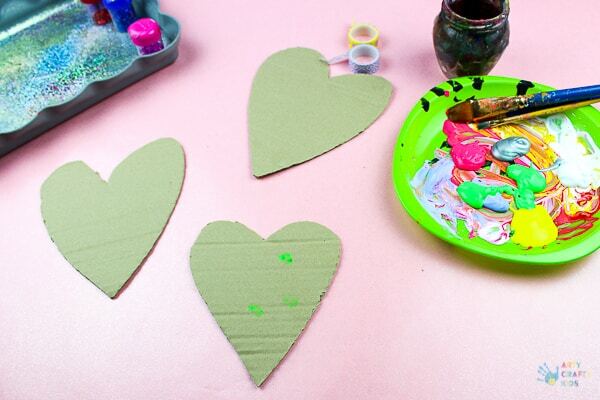 Step 1: Create the heart canvas’ by cutting out hearts shapes from a piece of cardboard. 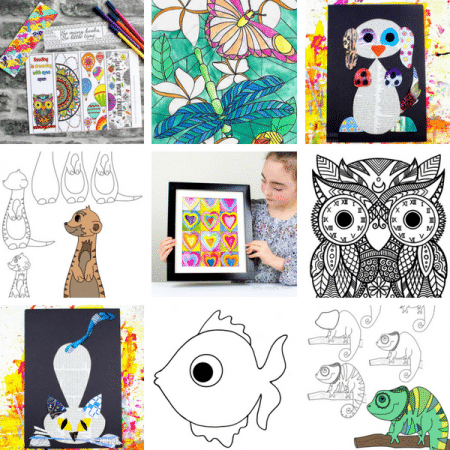 Step 2: Hand over to your Arty Crafty Kids, supplying them with paint and materials to explore. Once the children have painted a base layer of colour, perhaps they could experiement with stamping. They could try shaping paper rolls into hearts and creating heart prints. Splat painting can be controlled by brushing a blunt knife against the brush. Bubble wrap is fabulous for prints. And bottle tops are great for stamping! Step 3: Perhaps add some washi tape? Step 4: Or even a little glitter. 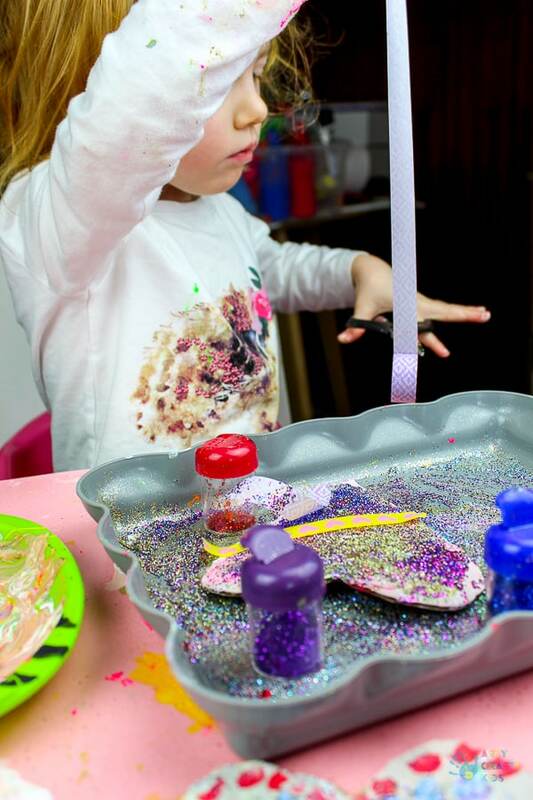 To keep the glitter under control, we have a dedicated glitter tray and with a few boundaries in place, this helps to keep it contained and fun to use! Step 5: Add tassels to the bottom of the hearts (this step is entirely optional and can also be substituted with pom-poms if desired). Tassels are very easy to make. 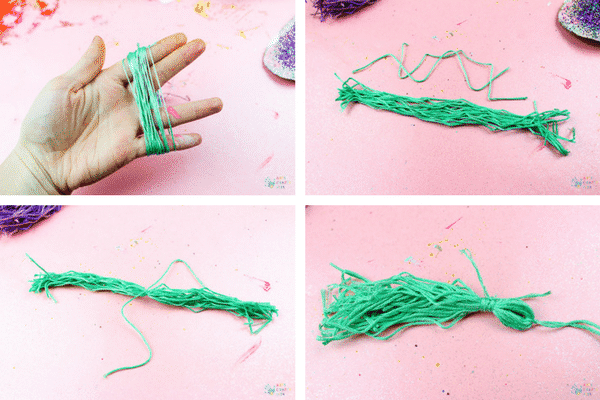 Simply spread your fingers out and wrap some embroidery thread around your fingers. Gently slip the hooped thread off your fingers and cut one end of the hoop to create a bunch. Remove two threads from the bunch and tie one around the centre, leaving two loose ends. Fold the bunch over at the point of the knot and tie the second piece of thread around the bunch, wrapping it around several times as shown above and secure with a knot. Step 6: Fasten the tassel to the bottom of the heart, piercing a hole with a hole punch or round head pliers. Before securing the tassel to the heart, add a few decorative beads to the thread. 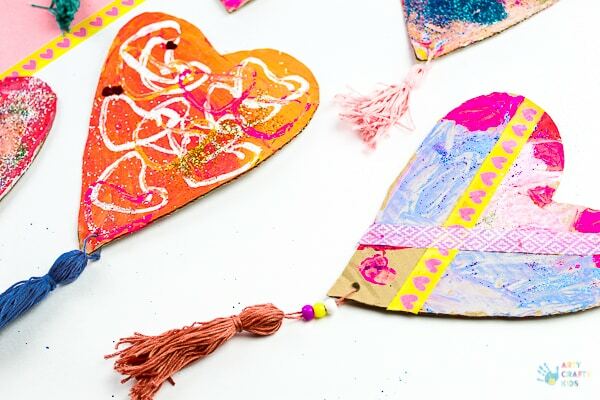 To transform the hearts into decorations, they could be hung individually on the wall using string or thread together to create a unique heart garland. I hope your Arty Crafty Kids enjoy the process of creating their Recycled Cardboard Heart Decorations.